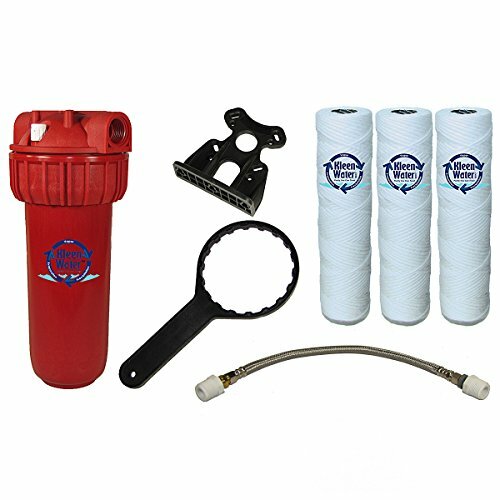 The KleenWater KW2510HT dishwasher filtration package includes one high temperature hot water filter, filter wrench, mounting bracket with screws and three 5 micron high temp cartridges with scale inhibitor ingredient. This system also includes all necessary installation components. Water with significant mineral content is considered hard. Private well water as well as municipally supplied public water can have excessive hardness content. Hard water typically causes aesthetic difficulties. One such difficulty is cloudy glassware and dishware. Our dishwasher hot water filtration package can substantially improve your glassware and dishware appearance. The KW2510HTSW filter cartridge contains polyphosphate that sequester the calcium and magnesium creating a very effective scale inhibitor. The KleenWater KWHW2510 housing is made in Italy of reinforced polyamide. It is rated for maximum temperature or 180 degrees F. The inlet / outlet is 3/4" FPT reduced to 3/8 inch. A pressure relief valve allows easy cartridge change. The water filter dimensions are approximately 5 inch (W) X 12 inch (L). Typical installation requires 20-25 minutes. Cartridges should be changed every 6 months.